In 2001, the NCAA took a very proactive stance against states that prominently displayed the Confederate Battle Flag. The organization imposed a ban on those states from hosting any pre-determined sporting events during the playoff season. For the past thirteen years, Mississippi and South Carolina have not been allowed to host any bowl or playoff games…until recently. The Lady Gamecocks (University of South Carolina’s Women’s Basketball Team) are entering post-season play at the number one spot in the NCAA Championship Tournament for the second year in a row. The way the post season playoffs works is, the NCAA rewards the top sixteen seeds in the tournament with an easy travel schedule and the right to host playoff games. Last year, the Lady Gamecocks entered the tournament a top seed but spent March travelling which had an inverse effect on their performance. Some sports writers were quick to point out that the NCAA’s playoff ban in South Carolina contributed to their upset loss to Kansas. Sports writer Gene Sapakoff pointed out that the NCAA’s ban not only hurt the Gamecocks, but backfired as well. Little changed in regards to the prominent display of the flag. This year, it seems that there is a loophole in the rule. For the first time in over a decade, South Carolina is hosting a playoff game. The NCAA applied a new format to the post-season; top seeded teams are rewarded with home dates during March madness. Despite the fact that the ban is still in place, the Lady Gamecocks will be hosting playoff games due to their status as a premier basketball program. The NCAA stated that the new format allows teams to earn home games through their performance. These playoff game locations were not predetermined and therefore admissible under the guidelines of the ban. As expected, the NAACP responded with outrage. It appears that the NAACP was not informed about the ruling ahead of time. According to one member, the NAACP was not very proactive in their attempts to change the minds of the NCAA once news of the new format got out. It appears for now that the NAACP is accepting the NCAA decision; but they definitely do not agree with it. I suspect the NAACP will renew their efforts once playoff season is over. A couple of questions arise out of this flag controversy. The obvious question regards the fairness of the NCAA’s new play-off format. I tend to lean towards “yes.” As a former college athlete I understand the hardships of travelling to compete. Travel schedules wear on athletes. To condemn a team to an all travel schedule is to stack the odds against them in an active manner; especially when programs of similar success are able to reap the reward of a home crowd during competition. It is not the fault of the athletes that the flag is still prominently displayed; nor do I think it is appropriate that the NCAA should punish their athletes for the actions of the state’s political leaders. This new format, which does not pick predetermined locations, rewards the success of the athletes who may not be from the state to begin with. This format should not be compared to the scheduling of a bowl game in South Carolina like one often sees in football. The first question however, sort of makes me wonder if the NCAA believes in the ban or not. Does the NCAA expect change to take place as they implement the ban, or are they only maintaining the ban due to pressure from groups like the NAACP? I think this new format with the loophole for successful teams speaks volumes about their determination. Right. And the NCAA violates its own rules by discriminating against member institutions. It’s the Confederate flag today…but what will it be tomorrow? What other political or social issue will they interject themselves into? I don’t think I could classify their post-season ban as discrimination. All are still allowed to participate. Where the ban comes into play is revenue. The biggest player in that ban is football. Bowl games generate an obscene amount of revenue for the state. They are sticking it to the state in that regard; not the institution. At the Capitol building in Montgomery, AL, stands a very prominent Confederate monument with flags (all of them). There are a few Southern states that have displays at their state house, but it’s not the same as SC or Miss. In both states, it’s about why the flag went up in the first place. 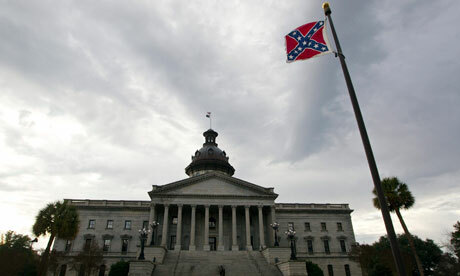 Though South Carolina’s particular situation might call for re-examination not that the flag is a-part of a memorial.